The characters, starships, and situations of the original Star Wars™ trilogy come to life in Star Wars: The Card Game. A game by award-winning designer Eric M. Lang, Star Wars: The Card Game is a head-to-head Living Card Game® of tactical combat and strategic planning that invites two players to wage cinematic battles between the light and dark sides of the Force. Throughout the game, the dark side works to snuff out the last remnants of opposition and secure total control of the galaxy. This is represented by advancing the game’s Death Star dial.The dark side advances the dial at the beginning of each of its turns and can accelerate its advancement by launching successful attacks against the light side. If the dial advances to “12,” the dark side wins. Given enough time, the dark side player will discover the last remnants of the light side’s resistance and wipe them out of the galaxy with a final, commanding gesture. Thus, just like in the movies, time is always running out for the light side, and its heroes must find the means to strike quickly and for maximum damage. The light side player wins by destroying three dark side objectives, cards that represent a player’s missions or strategies. However, destroying an opponent’s objective requires getting sufficient firepower past Imperial defenses. Most of this firepower comes from unit cards, representing the characters, creatures, droids, vehicles, and starships that players may use to strike against their opponents. Enhancements like skills, weapons, and other items make your units more effective in battle, while other enhancements like locations can allow you to expand your play area and accelerate your strategy. The faster you can accelerate your strategy, the faster you can launch massive starships like Home One or Devastator. Meanwhile, it pays to carry some tricks up your sleeve (or hidden in your armor), and events represent the unexpected developments of the battlefield – daring maneuvers, special powers, disasters, traps, and other sudden effects. Star Wars: The Card Game offers a straightforward and accessible play experience. Each turn, players mobilize their forces, drawing upon their resources to deploy characters and starships and launch them into battle. Several mechanics propel the game, adding to the drama while keeping players focused on the action. To play cards, players must spend the resources they generate by placing focus tokens on their ready affiliation cards and objectives. Some units and enhancements also contain icons with resource values, and players can use these cards to generate resources, as well. Placing a focus token on a card indicates that it has been committed to a specific activity or course of action. If a card has no focus tokens on it, it is considered ready, but once given a focus token, the card is exhausted. Exhausted cards can’t be used to generate resources or take actions until after their controllers have removed all focus tokens from them. Typically, players remove one token from each of their cards during the refresh phase, but some cards can be focused twice in a single moment, and some cards allow players to place focus tokens upon their opponent’s units, luring them deeper down the paths they have chosen. These tactics can leave units unable to fully refresh and thus unable to respond to alternate threats. The dark side player places a focus token on Grand Moff Tarkin to generate a resource. While the focus mechanic permits greater tactical depth than the simple binary dynamic of “used or available” found in most card games, it also adds an exciting dimension to the game’s combats where units must focus to strike against their opponents. The original Star Wars trilogy is loaded with thrilling and direct confrontations between opposing starfighters and squads of Rebel and Imperial troopers. Smugglers confront bounty hunters, and Jedi face off against Sith in epic lightsaber duels. The trilogy is also full of daring tactical maneuvers and cunning ploys to buy the heroes just enough time for their plans to come together. Likewise, during combats, the focus mechanic permits players to feint or otherwise manipulate their opponents. In an edge battle, players vie for initiative by secretly bidding cards from their hand facedown, one at a time, beginning with the active player. Once both players have passed or run out of cards to bid, they compare the number of Force icons on the cards they’ve bid, the cards they bid are discarded, and the winner gains the edge, earning the right to strike first. To strike, an attacking or defending unit focuses. Then it applies the effects of all its combat icons. Unit damage: Deal one point of damage per unit damage icon to an opposing unit in the same combat. If a unit takes an amount of damage equal to its hit points, it is destroyed. Blast damage: When it strikes, an attacking unit may deal one point of damage per blast damage icon to the attacked objective. If an objective takes damage equal to its damage capacity, it is destroyed. Tactics: Place one focus token on an enemy unit. This cunning ploy may prevent an enemy unit from striking in combat or disrupt your opponent’s plans by exhausting a unit your opponent had intended to use later. It pays to win the higher ground, and the player who gains the edge may earn benefits beyond the right to strike first. The player with the edge may also gain the upper hand with additional, situational combat icons. White combat icons like the unit damage on the AT-ST shown above are activated when you have the edge. Black combat icons always trigger, whether you have the edge or not. The edge battles of Star Wars: The Card Game ensure that no cards in a player’s hand are ever without value. The dramatic tactical advantages won by the player with the edge may sometimes grant more worth to a card in a player’s hand than it would have on the table. As light and dark side players look for every weakness they can find in their enemies' defenses, they’ll develop clever strategies to draw cards out of each other’s hands prior to key edge battles. Just like in the movies, you may find your foe full of surprises, and to win the edge you’ll need to master the vital skills of hand management. Finally, at the end of each turn, players enter the Force phase, where they seek to sway the balance of the Force by committing their units to the light side or the dark side. Committed units add their Force icons to the Force struggle, and the player with more committed Force icons flips the game’s Force card in his side’s favor. However, such commitment to the Force comes with a burden, and when a unit committed to the Force strikes in combat during subsequent rounds, it receives two focus tokens instead of one. Still, the Force flows through all things and binds them together, and the balance of the Force has a profound effect upon the game. When the balance of the Force tilts in favor of the light side, the light side player may deal one damage to a dark side objective on each of his turns. When the balance of the Force favors the dark side, the dark side player advances the Death Star dial an extra point on each of his turns. This model also presents a compelling new deck-building challenge for veteran card players. Traditionally, veteran players approach customizable card games by evaluating the worth of every individual card in a deck. 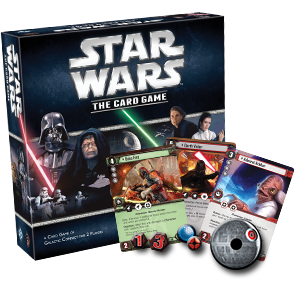 Star Wars: The Card Game, however, explores exciting new design territory; players are faced with the task of evaluating groups of cards and building a deck by selecting among those groups. This new approach allows for intense strategic customization, while still maintaining core thematic elements from the Star Wars saga. Faster deck-building and truly awesome legends – that’s the idea behind the new deck-building model of Star Wars: The Card Game! The Star Wars: The Card Game presents six different affiliations, three each for the light and dark side. Imperial Navy: The Empire established command of the galaxy through the strength of its massive fleet. The Imperial Navy faction excels at spreading out across the galaxy with capital ships, starfighters, troopers, and visionary leaders such as Grand Moff Tarkin. Sith: Drawing upon the tremendous power of the dark side of the Force, the Sith rule the galaxy through fear. Led by Emperor Palpatine and Darth Vader, the dark lords of the Sith aim to crush their opponents’ throats and ambitions. Scum and Villainy: Money can’t solve every problem, but it can buy a lot of answers. With a cast of unscrupulous characters like Boba Fett, a host of enhancements, and tricky tactics, this affiliation proves it’s worth every credit. Rebel Alliance: Borne upon the wings of starfighters and the backs of Rebel troopers, the spark of freedom still flickers throughout the galaxy. Leia Organa, Admiral Ackbar, and other leaders of the Rebel Alliance call upon their pilots and soldiers to make quick, tactical strikes against the Empire. Jedi: The fire of these adherents to the Old Ways has not completely extinguished. Luke Skywalker, Obi-Wan, Yoda, and others ally themselves with the light side of the Force. They make good use of their training, their Jedi mind tricks, and their finely-crafted lightsabers. Smugglers and Spies: This affiliation features the light side’s heroic rogues and scoundrels, typified by Han Solo. They’re tricksters and fighters who make good use of their quick minds and quick reflexes. ​Much as the different affiliations work toward a common cause in the original films, they can join together in Star Wars: The Card Game to rule or save the galaxy. Players who take advantage of the game’s deck-building options can mix affiliations from the same side of the Force. The characters and themes of Star Wars come to life during the thrilling battles of Star Wars: The Card Game! © & TM Lucasfilm Ltd. Living Card Game, LCG, and the LCG logo are ® of Fantasy Flight Publishing, Inc.